Boasting charming elegantly-refurbished accommodations, expansive meeting spaces, and attentive service, The Middlebury Inn is a delightful historic Vermont hotel blending modern conveniences with its rich history. Formerly known as the Addison House and the Vermont Hotel, The Middlebury Inn was built in 1827 and originally operated as a pub. Adorned with ornate period fixings, The Middlebury Inn affords elegant interiors, celebrating its treasured past with thoughtfully-appointed elements, including the original front desk, high ceilings, and wide hallways, built to accommodate the hoop skirts of ladies at the time. Offering a business center, the Waterfalls Day Spa, access to a fitness center, and true Vermont cuisine at Morgan's Tavern, the hotel seamlessly integrated contemporary services and facilities without compromising the integrity of its architectural and historic elements. Situated in the heart of Champlain Valley, the charming town of Middlebury is surrounded by the Green Mountain National Forest, affording a convenient gateway to relish in the beautiful Vermont landscape. Lined with quaint shops and exciting cultural attractions, Middlebury invites a comforting ambiance that complements the warm hospitality, comfortable accommodations, and exceptional amenities of The Middlebury Inn. 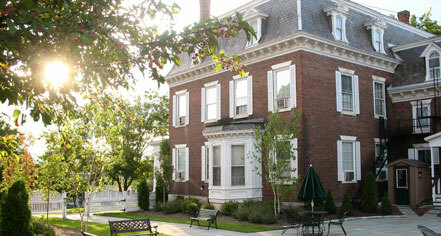 The Middlebury Inn, a member of Historic Hotels of America since 1991, dates back to 1827. The inn site was a natural one for a tavern, since it lay near the intersection of north/south and east/west routes. In 1794 a tavern house was built on this plot of land and operated until 1816 when it was destroyed by fire. Adjoining Rooms: Very few adjoining rooms are available. Please contact hotel to reserve. Cribs and Pack-in-Plays: Limited availability; $15 per night. Early Check-In/Late Check-Out: Subject to availability. Fees may apply for late check-out. Extra Person Fees: $15 per night. Hotel/Resort Fees & Taxes: All reservations may be subject to a 10% tax. Pet Policy: Service animals allowed: Yes. Pets allowed: Yes. Fees: $35. Rollaways: Available upon request; $15 per night. 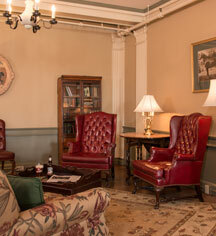 Learn more about the History of The Middlebury Inn .